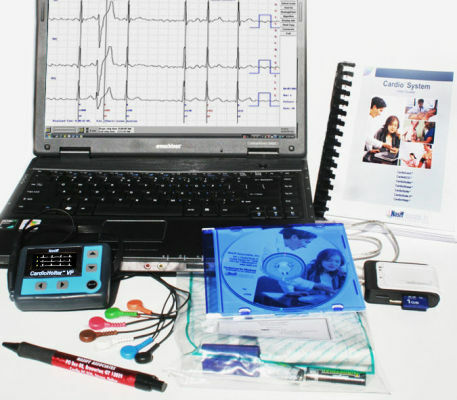 Complete digital, 24-48 hour, EMR compatible, PC based holter system. ONE (1) Flash Digital 24-48 hr. Full Disclosure Recorder. Complex classifications: PVC, Couplet, Triplet, Bigeminy, Trigeminy, R on T, SVPB,Bradycardia, Tachycardia and more. On-Screen Condensed / Zoom View: 1 or 10 min., 2 or 4 sec. Intervals. Standard Reports to Screen or Printer: Summary of Test with Diagnostics, Event / Episode Reports, Full Disclosure of all ECGâs, Heart Rate Variability Histograms, R-R Dispersion Graphs, ST Graphs, VF Tables / Graphs, ST Severity Tables. Storage of Patient ECG Records to Hard Drive, Floppy or Any Storage Medium. For flash recorder: Removable COMPACT FLASH memory cards(Standard CF compact flash card). Flash uses CF compact flash card slot as Download Interface (we supply this).